Create a home office space worthy of an executive with this L-shaped desk. The large desk offers great storage and work space, with modern features like two built-in AC outlets and adjustable shelving. 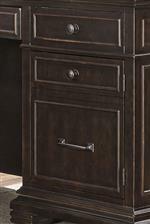 Framed drawer fronts, stacked block feet, and a dark Brown finish speak to refined traditional style. 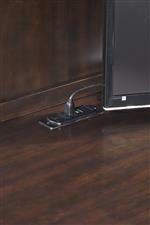 The Weston L-Shaped Desk with Built-in Outlets by Aspenhome from Bullard Furniture. We proudly serve the Fayetteville, NC area. Product availability may vary. Contact us for the most current availability on this product. I35-307-1 66" Desk for a Return 1 66" 30" 31"
I35-308 48" Return Desk 1 49" 19" 31"
Case Detail Turned legs, framed drawer and door fronts. Create a space that reflects your sophisticated style with the Weston collection. Detailing like turned legs and framed door and drawer fronts showcase classic style, while a dark Brown finish over poplar solids and cherry veneers brings a refined feel to your space. Though traditional in style, modern features like built-in AC and USB ports, adjustable shelving, and file storage promise convenience and function. Inherently sophisticated and packed with smart function, the Weston collection has everything you need to create the perfect home office space or bedroom. 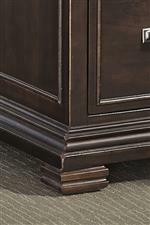 The Weston collection is a great option if you are looking for Traditional furniture in the Fayetteville, NC area.